In 2016, Spectrum Reach (formerly Time Warner Cable), introduced a package for geographic zone buying of television advertising called Local Connect. A Local Connect package guarantees a certain percentage of household reach of cable TV homes within a zone during a three to five week period. Both 40% and 60% reach options are available. Spectrum verifies the reach using data from their customers’ set-top-boxes (STB) and provides it to the advertiser at the end of each schedule. For example, in Austin, an advertiser can buy a 40% Local Connect package for the northwest zone and be guaranteed to reach 40% of Spectrum and ATT households in that zone at a cost of $1,818. The 60% package costs $3,468. The package includes the top cable networks such as ESPN, TNT, TBS, USA, Bravo, Comedy, and many others. The advertiser has no control over the network mix, time slots, or frequency. But, for Spectrum to deliver the guaranteed reach I think it is a reasonable business assumption that a significant percentage of the Local Connect spots will air on top networks during primetime. 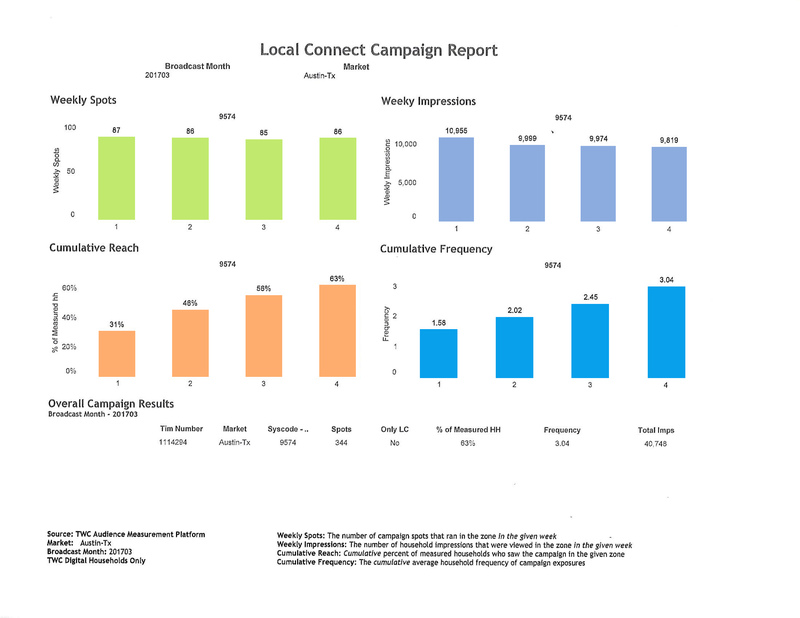 Local Connect is an intriguing concept to a veteran media buyer like me because of the reach guarantee and the use of STB data to measure viewership. (In my opinion, Spectrum should consider using set-top box data to measure reach and frequency for all their clients’ buys, not only the ones that buy Local Connect. The downside is giving up control of the details of the buy. A few months ago I discussed LC with a client for whom I manage zone advertising campaigns and he was willing to give it a try. 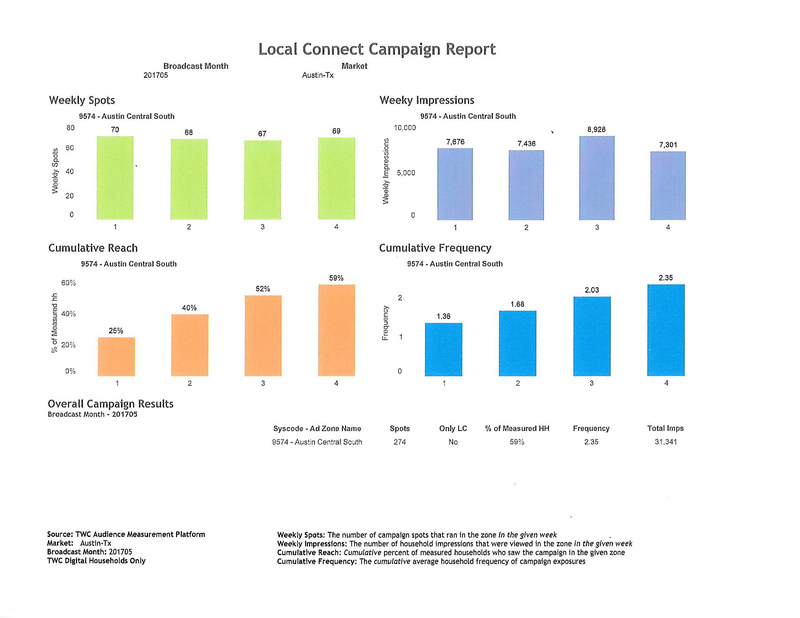 Data from my client’s campaign from March through May of 2017 revealed important insights into Spectrum’s Local Connect. My client and I selected the 40% Local Connect (LC) package for Spectrum’s Central South Zone in Austin at a cost of $1,626. Spectrum estimated that about 259 spots would air. In March and April I supplemented the LC package with a $424 TNT buy ($354 in March, $70 in April). The total March buy was $1,980, the total April buy was $1696. May was 100% LC, total buy $1,626. March: LC-40% + the $354 supplemental buy resulted in 63% reach, 3.04 frequency. Spectrum prices their LC-60% at $3,468 compared to the $1,980 we spent to get 63% reach. This seems to recommend combining LC with a customized buy but read my conclusion for more information. April: LC-40% + the $70 supplemental buy ($1,696 total budget) resulted in 66% reach, 3.05 frequency. Spectrum lists 20 networks for the Local Connect packages. They break the networks into two categories, Top 10 Rated Networks and Non Top 10 Rated Networks. ESPN, TNT, TBS, and USA are among the Top 10 Networks. In March through April, 828 LC spots aired. USA – 0 as in no spots ran on USA over the three month period. TBS – 4 spots or 0.5 % of LC spots over the three month period. TNT – 6 spots or 0 .7 % of LC spots over the three month period. ESPN – 29 spots or 3.5 % of LC spots over the three month period. The total number of spots that ran on the top 10 networks, as defined by Spectrum, for the three month period was 147 or 18%. Spectrum News was not on the Local Connect list of networks presented to the client and me but surprise, surprise, 104 spots of the 836 LC spots that aired ran on Spectrum News. Bravo with 41 spots had the second highest total. Spectrum reported 118,722 household impressions over the three month period, 48,309 of those impressions were from Spectrum News. So, nearly 41% of the impressions for the three month period came from Spectrum News. If I knew Spectrum News was going to be included I would still have moved forward with the trial and once the trial was in progress, I would have requested that they reduce the number of Spectrum spots that were being included. Since Spectrum News was not listed in the networks to be included in LC, I believe that Spectrum’s presentation was a bit of a misrepresentation. I think Spectrum should consider renaming Local Connect, Spectrum News Local Connect. In other words, Spectrum delivered their guaranteed reach by overloading my client’s schedule with Spectrum News spots. For a small percentage of advertisers, who target mostly news viewers, a package like this would be appropriate. With 10 spots total running on USA, TNT, and TBS combined for the three months I was disappointed, to say the least, with the network distribution and I will not be recommending the Local Connect package to clients. In the future the data from the trial will be very useful in putting together customized zone buys for my clients. 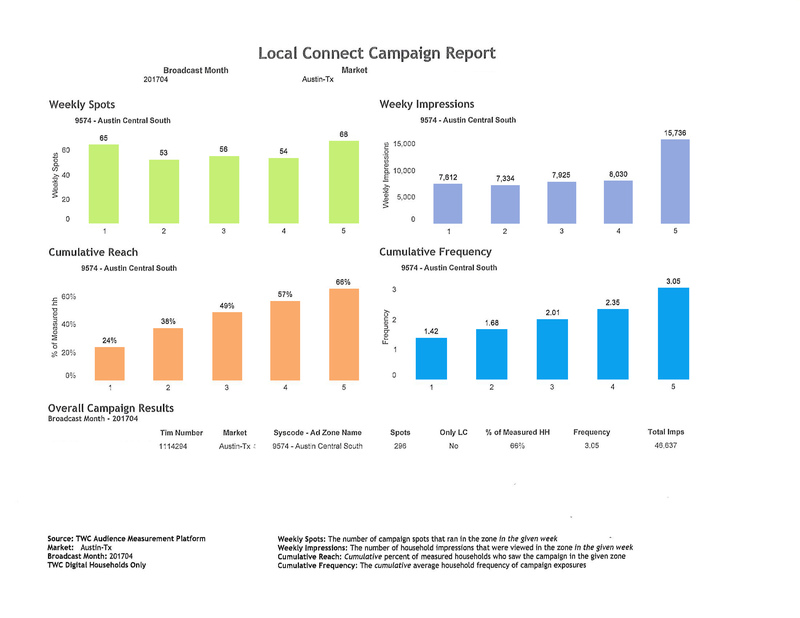 If you’re interested in more information on Local Connect or an analysis of your television or radio media buys, call (512-736-8308) or email me to schedule a telephone conversation.